Egypt's historic Al Alamein Hotel has officially reopened after a major facelift by Emaar Hospitality Group, making it one amongst the finest resorts along the Mediterranean. The opening event was attended by the Egyptian Minister of Tourism, Dr Rania Al-Mashat, VIP guests, top media figures, as well as other public figures. 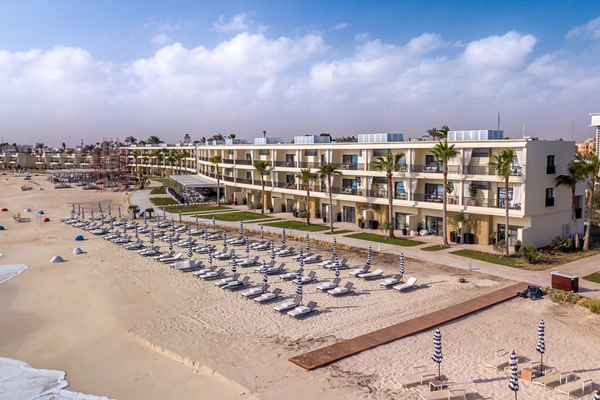 Situated in the picturesque setting of Sidi Abdel Rahman Bay, the hotel's glamorous design ethos and refurbished retro-modern interiors hark back to the glory days of the 1960s, when the resort first opened. The remodelled designs blend vintage charm with contemporary style, evoking a sense of nostalgia to the golden age of Egyptian music and cinema. "We strive for nothing less than the highest global standards for our customers and our developments in Egypt including Al Alamein Hotel, for which renovation costs totalled EGP1.5 billion ($83.6 million)," Alabbar added. While the building stays true to its rich heritage, visitors can expect modern comfort and style everywhere, from the bar and restaurants to the corridors and rooms. There is something remarkable around every corner of the resort. An impressive assortment of black and white photographs of Egypt's most celebrated classical actors and singers festooning columns at the lobby offer visitors much to marvel at once they walk into the building. The hotel is also home to the renowned Umbrellas sculpture by Greek artist George Zongolopoulos, a poetic structure of steel umbrellas that stretches 13 metres into the sky, offering a dramatic reinterpretation of Abdel Halim Hafez' classic oldie ‘Dokko Elshamasy’ or ‘Fix the Umbrellas on the Beach’. One of the most photographed modern sculptures worldwide, the piece was first displayed at the Venice Biennale in 1995, where it drew international attention, and will now delight visitors to this glamorous Egyptian vacation spot. The hotel also boasts a magnificent collection of art works and sculptures by a large number of local and global artists, including an iconic mosaic mural of late legendary Egyptian singer Om Kolthoum and another one featuring colourful ancient boats.